One of the things I look forward to in the fall is winter squash. This week at Trader Joe’s they had acorn squash, kabocha squash and butternut! Four of the squash beauties came home with me. The humble acorn squash is lovely on its own but sometimes I want something just a little more special. It becomes an elegant entree when oven roasted and stuffed with a delicious curry mixture. 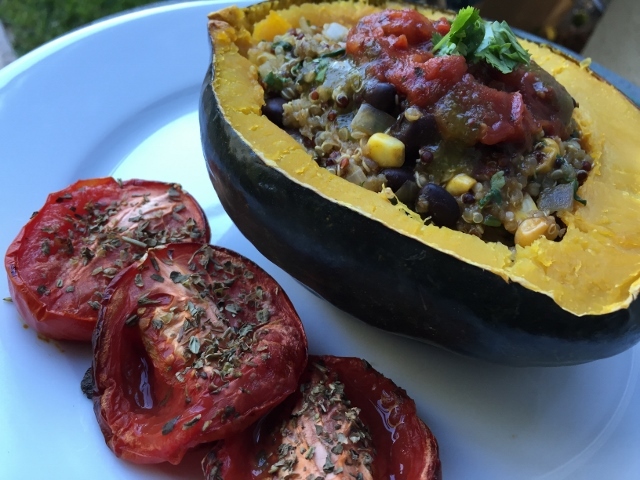 I was inspired by a stuffed acorn squash recipe I saw in the Happy Herbivore Abroad cookbook. I doubled the curry, added garbanzo beans and onions and deleted the dried fruit. These changes gave it a protein and fiber boost and took it from a simple side dish to a delightful entree. We like it so much that I’ve made it several time since and I have even doubled the recipe. The leftovers heat up well and make for a quick heat and eat meal a day or two later. You know how I love leftovers! It’s beautiful enough to serve company or it can be a special entree for the holidays. If you don’t like curry – no worries I have a Mexican version that is just as delightful. Simply use cumin, chili powder, black beans, corn, cilantro and lime juice. Yesterday I roasted two acorn squash and made a recipe of each curry and Mexican. They reheat nicely and make for a lovely quick meal on a busy day. Add a simple side salad and your meal is complete. *To make it easier to cut the squash in half, pierce it a few times with a sharp knife and place it in the microwave, heating on high for 4-5 minutes. It will soften the skin just enough to cut easily. **Curry powder varies greatly in the amount of heat it has so use as much or as little as appeals to your taste buds. Place prepared squash upside down on a baking sheet lined with parchment paper. Bake 30-40 minutes or until fork tender. The size of the squash will determine how long it needs to bake. I had one large acorn squash that took 45 minutes. Meanwhile, combine quinoa, onion,vegetable broth, curry powder in a medium size pot. Bring to a boil, reduce heat to low cooking for 15 – 20 minutes or until all liquid evaporates. When quinoa is cooked, add spinach, cilantro and garbanzo beans, stir to combine, put lid on pot and set aside until squash is ready. When the acorn squash is fork tender, remove it from the oven, turn over and evenly divide stuffing mix in the cavity of each half. It will be really full! If your squash is smaller it might not hold all the stuffing so just put the extra along side the squash on the plate. Garnish with POM seeds. Serve hot. Notes: Skip the curry powder and vary the type of beans and spices used – for instance black beans and cumin or white beans with Italian seasonings. Use double the spinach to bulk it up if you wish. I used 1/2 teaspoon ground cumin, 1/4 teaspoon Chile Chiptole powder, 1 small Chiptole in Adobo sauce finely minced plus about 1 teaspoon of the adobo sauce – its not salt free so you could use a jalapeno pepper instead. Use 1 cup black beans and 1/4 -1/2 c frozen corn, 1/4 c cilantro and 1 tablespoons fresh lime juice. Garnish with more fresh cilantro and salsa. 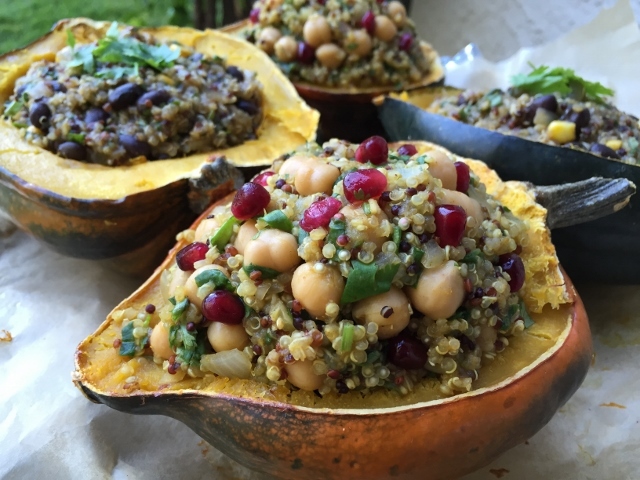 This recipe was inspired by the Stuffed Acorn Squash recipe from Happy Herbivore Abroad cookbook. Feel free to leave a comment or ask a question – I enjoy hearing from you. What’s your favorite type of winter squash? I love, love, love the kabocha squash! Its creamy and kind of sweet and you don’t have to peel it. This looks so good, Tami! Kabocha is my favourite squash but I also like acorn and butternut. My husband won’t eat squash, unfortunately. Well then if hubby won’t eat it then there is more for you to enjoy! 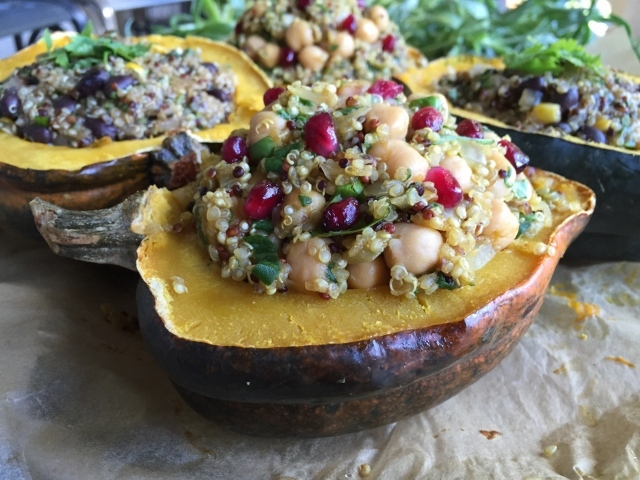 I pretty much love all types of squash – its so filling! Happy cooking Sabine! Sounds delicious & looks absolutely beautiful! Perfect for entertaining! I’m looking forward to making butternut squash soup! Thank you Jody we love it! I made this tonight Tami and my omnivore husband loved it! It looks spectacular, a perfect dish for a dinner party. So easy but looks like you spent hours cooking!! Thanks For the recipe Tami. Caroline – Thank you for letting me know that it was well received by your hubby! It would be a lovely dish to serve company.